Give your office the workspace you need and the style you deserve with the Bush Business Furniture Studio C 72W bow front desk, credenza and mobile file cabinets. The extended bow front desk surface offers extra space to spread out with a computer and more while giving guests a rounded front to pull up a chair and collaborate. With a thermally fused laminate finish, the office furniture set Stands up to years of everyday use. The popular, classic desk design receives a contemporary update with trendy White and Storm gray finish options to fit seamlessly in a private office or as part of a larger environment. Keep pesky computer cords out of your way with the cable management system for an organized bow front desk work surface. Make room to spread out and work on a variety of projects on the 72W credenza desk while storing your paperwork in the mobile file cabinets. For your letter, legal and A4 size files along with office supplies, the contemporary cabinets roll anywhere or remain in place as needed. File drawers open on smooth full-extension ball bearing slides for an easy reach to papers in the back. 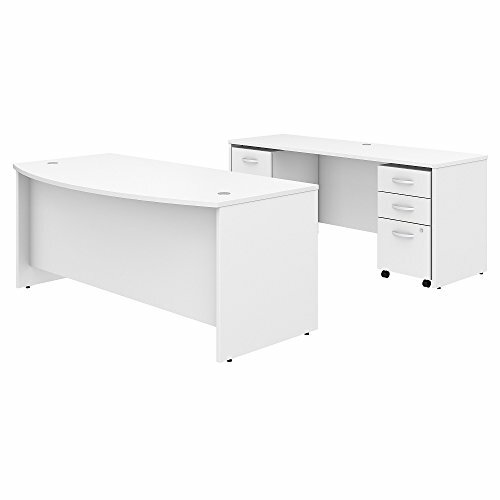 This commercial office furniture set comes with a 10 year warranty and meets ANSI/BIFMA quality test standards for performance and safety. American made with U.S. And imported parts. OFM 66266-MPL Mesa Series Double Pedestal Credenza, 26.75" x 67"